Global Citizens Festival 2014, Central Park, NYC. Pictured l to r, Global Citizen Project Co-founder Hugh Evans; World Bank President Jim Young Kim, actor Hugh Jackman, UN Secretary-General Ban Ki-moon and the group No Doubt. Surrounded by a roaring crowd of an estimated 60,000 people, United Nations Secretary-General Ban Ki-moon was joined last night by a star-studded roster of the world's leading performers as he helped kick-off the third annual Global Citizen Festival – a celebration of global unity and a reaffirmation of the will to address the planet's most pressing issues. 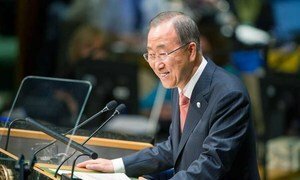 Coinciding with the high-level segment of the UN General Assembly, which opened at the world body's Headquarters this past Monday, the Festival has almost become an unofficial side event to the Assembly itself and has attracted a host of world leaders who have voiced their commitment to the issues of sustainable development, poverty and climate change. Among those in attendance last night were the Prime Minister of India, Narendra Modi; the Prime Minister of Norway, Erna Solberg; and Jim Yong Kim, the President of the World Bank. “The United Nations has heard your voices tonight loud and clear. You are the generation that can end extreme poverty by 2030,” Mr. Ban declared. Nevertheless, to the tune of Jay-Z, No Doubt, Fun, and Carrie Underwood, Mr. Ban reassured the crowd that hope was on the horizon. Warning that the world’s “fasten seat belt” light is illuminated, Secretary-General Ban Ki-moon today opened the 69th annual debate of the United Nations General Assembly with a call for decisive leadership at a time when the ghosts of the Cold War have returned and much of the Arab Spring has gone violently wrong.